Are you looking for top root canal treatment in the Bay Area? Dr. Samir Ayoub of San Francisco Aesthetic Dentistry is invested in the health of your teeth and gums, and he will do everything he can to help you maintain your oral health. When a tooth is compromised, Dr. Ayoub has a variety of treatments that he can recommend to address the damage and avoid serious consequences. A Root canal is a treatment that Dr. Ayoub uses to save a tooth that is infected and in danger of needing to be removed. Traditionally, root canals were considered to be an unpleasant experience, but modern techniques and technology help make the procedure more successful without significant pain or discomfort. A root canal in San Francisco with Dr. Ayoub can save your tooth and preserve its chewing function while maintaining a normal appearance. Root canal treatment becomes necessary when the soft tissue inside the tooth — referred to as dental pulp — becomes inflamed or diseased. This could happen if the pulp is exposed to oral bacteria through a cavity or if the tooth is badly cracked or fractured by a hard blow to the face. When the pulp is traumatized, the tooth can start to die and is at risk of needing to be removed. Unless you have sustained a forceful accident or trauma, it may be difficult to tell that your dental pulp has been damaged or infected. You might not know there is a problem and you need a root canal. 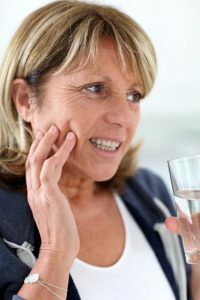 One of the signs you have a problem is minimal to severe oral pain (of which the cause is unclear). Other signs include tooth discoloration or swelling and irritation in the gum tissue. Should you experience any of these symptoms, make an appointment with Dr. Ayoub as soon as possible for an examination. At the beginning of your appointment, Dr. Ayoub will numb the tooth so you don’t experience any pain during treatment. He will access the pulp chamber and associated canals and delicately remove the infection and debris (including nerve tissue, lymph tissue, blood tissue and bacteria). Dr. Ayoub is careful to avoid damaging the surrounding ligaments and bone. He may take digital X-rays to help him visualize the area. After removing the affected tissue, Dr. Ayoub will disinfect the tooth and fill it with special biocompatible material called gutta-percha or bonding resin material. Dr. Ayoub will then fill the hole to the canal with a filling. In some cases, a permanent crown may be placed over the tooth to add strength and support. If the tooth is inflamed or infected beyond repair, tooth extraction may be the only solution. Dr. Ayoub can review the extraction procedure, as well as your tooth replacement options, with you in detail during an in-person appointment. One option is to use a dental implant to replace the entire tooth — root to crown. Another option is the placement of a dental bridge. If you are experiencing oral pain, or if you have been told that you need a root canal, contact Dr. Samir Ayoub and make an appointment at our San Francisco dental practice. You can reach us by calling (415) 781-2227.